It was a rough day. I had a conversation with a friend that centered on two other young women who have cancer. No, the cancer wasn’t the center of the conversation – God was. Sometimes things are said by those who mean well that make God into an unlovable, horrible, callous brute. Then, there were some family issues that were tinged with frustration and sadness at situations that didn’t need to be as difficult as they actually are. Some systems intended to keep organizations running smoothly neglect to factor in human intentions, emotions or compassion. Yet, we must somehow navigate those systems to the best of our ability without loosing hope. The final blow was the bird. It flew directly into my picture window, leaving some of those soft, belly feathers behind. I looked out and saw the poor thing laying in the dirt. If birds could pant, it was panting. One little leg was curled in…the other stretched out and twitching. I didn’t know how to help it. I wanted to walk away, but couldn’t keep from looking back. It’s feeble, trembling breast seemed to be slowing down – indicating to me that that last of it’s life was slowly leaving that little body. The bird was a robin – to anyone who has lived through a Minnesota winter, the first robin of the spring is a symbol of hope – signifying that winter will loosen it’s mighty grip and warm weather will be a reality. Hope was dying in a pile of dirt in my front yard. I needed one more look at the bird for assurance that it was finally out of pain. That amazing thing was – it was gone! No, nothing could have ‘gotten’ it. It fell behind a short, brick wall where it was protected from predators. Besides, this was a span of about 5 minutes! It had recovered from it’s trauma – most likely it was temporary shock from having the wind knocked out of it. Apparently, it was once again going about life as a bird. Okay, a bird with a very bad headache and some stiff joints. But, none the less, it was alive! How often do we feel like God has abandoned us? Things happen, young mom’s get cancer, situations sap our optimism and energy, birds fly into windows and hope seems to be dying. Yet, if we give God a bit of time; some trust; and the opportunity to do what God does best, we will find that God is working in and through all situations. Sometimes we simply need to look in God’s direction and pant a feeble, ‘Help’. Sometimes we need to look at a another’s pain and recognize where and how we can ease their load. Sometimes – sometimes we need to breathe deeply, stop ranting and know that God is present…even if we have to look long and hard to see God’s at work. I guess that’s what it means to surrender it all to God. We frequently get caught up in the details of a story so much so that the real story can become lost. And, sometimes the meaning we take away from our stories focuses on the wrong thing. It’s like phonics – a word can sound completely different with a variety of pronunciations. Yet, it happens in different dialects all the time. Does that change the meaning of the word? Typically not. Yet, we fuss and fret over the correct pronunciation when the tomato [long ‘a’] or tomato [short ‘a’] is right in front of us an appears as a red, shiny fruit. (Ummmm – vegetable???) You get my drift… Perception is the result of our reality, or worldview. Our understanding of God is so much more convoluted than the tomato. Christians typically see God and Jesus as different characters. God takes the role as the hard-to-get-along-with-perfectionist of the Hebrew Bible, or Old Testament. Jesus becomes the good-guy-we-can-all-hang-out-with-hero of the New Testament. Two pretty complex and different personalities! So, who do you say that God is? I fully believe that Jesus came to set the record straight. And, I fully embrace that “God so loved the world that he sent his son…” [Jn 3:16]. But, what does that mean? Do we continue to look through the lens of the ancients that believed gods caused everything? Or do we look through the lens of Jesus and visualize that God loves? Do we accept the story of David that God forgives – even the unforgivable? Do we accept that sometimes life’s consequences are simply of our own making and we are still forgiven and loved in spite of all that we do…and don’t do? I recently read a quote that said, “God doesn’t really care what you do; God cares why you do it.” Who do you say that God is? How you answer that will determine what you do and why you do it. Maybe that’s Jesus’s example and message to us. My best guess? I like the story with the animals. I have chosen to call this blog “Sophia Meditations” for obvious reasons. 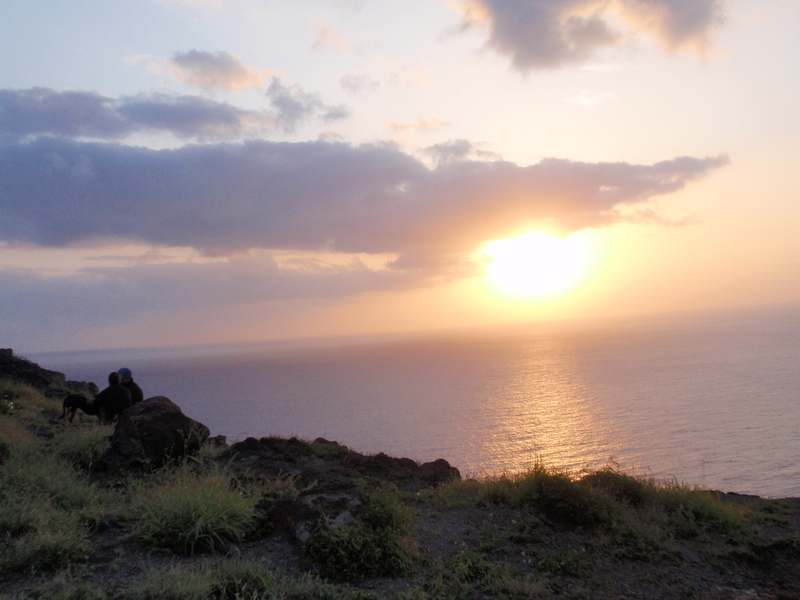 And, in view of that, I have selected a picture taken on Easter morning near the Makapuu lighthouse on Oah’u Hawai’i. We had the fantastic opportunity to hike the trail and watch the sun come up on Easter. Now, least you think we really got up THAT early, keep in mind that Hawai’i is 5 hours behind central daylight time. We actually slept in AND got to see the amazing sunrise. It was incredible to walk the trail in the dark. There was a reverence to it with quiet, almost whispered, voices. You could feel the anticipation as a trickle of light moved over the still waters. Then, the sun (Son???) in it’s brilliance broke through the darkness in full glory. Trust me, I wish we had brought bread and wine up there instead of donuts and coffee. But, sometimes we need to adapt what’s available to the situation…right??? God is present in all that is. Take time today to recognize his/her presence. Walk hand in hand with the One who loves you unconditionally and who offers unlimited joy.